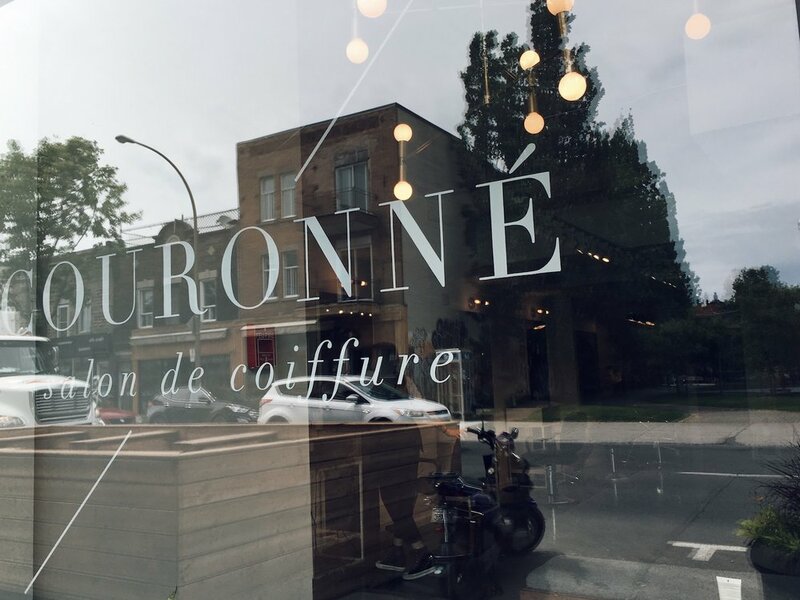 I find it so fitting that my stylist's salon is called La Couronné, in english this translates to the Crown. I love double meanings and in Iseult Beaudoin's case, she has often sculpted my (literally) 'just-out-of-bed do' into something that has left me feeling regal. Well..regal for at least one day. I met Iseult Beaudoin years ago upon returning back home to Montreal, from Vancouver, following the passing of my husband. My main reason for returning was to say goodbye to my mother, introduce her to my newborn son and place her in a palliative care home. Those days were ripe with bitter-sweet moments and meeting Iseult was perhaps one of the most memorable. As any mother will attest to, post-partum is a rough ride. Post-partum and grief x 2 is not for the weak at heart. Post-partum, grief x 2 and moving cities left me incredibly sleep deprived. Like a perpetually state of jet-lag due to seemingly never-ending holding patterns, I felt I was airborne, floating, waiting to touch down. We all know what our skin and hair feels like after a long intercontinental flight! My insides and outsides were screaming...nourish me! I recall one time going for a facial. I complained to the aesthetician, that the harsh Montreal winters were leaving my skin looking gray. Without knowing about my personal circumstances, she said, '"often our skin is a mirror of how we are feeling on the inside." One might judge it as vain to be thinking about skin and hair and finding a new stylist, when life and death are on the front lines, but there is a reason that donating hair to cancer patients is such an important and worthwhile cause. Regaining one's sense of self during loss can be a person's lifeline to reclaiming their power and joy in life. One cold winter day, my sister came over to cheer me up and said, "I just went to my hair stylist and she reminds me so much of you, she could be your sister!" Intrigued, I asked all about her and the next day I made an appointment for a hair cut. When I met Iseult, she worked at the Aveda salon on St. Laurent. She has now opened up her own salon with her partner Rachelle in Little Italy. I have watched in wonder, her art of not just cutting hair, but sculpting hair like a true artist. To this day, when I walk into her salon, I feel like it's an oasis. From the concrete floors, prop-lined succulents and cactuses, the beautiful and tasteful décor and lights from Lambert et Fils, my favourite indie bands playing through their speakers - the vibe is modern, unpretentious and always echoes with burst of laughter cutting through the white noise of hairdryers. Like a guest in her home, she always tends to me like the quintessential host. Upon being greeted with a huge smile, her or her staff will seat me, ask me if I would like something to drink (their Aveda tea is my favourite) and without asking, place an Aveda infused steamed facecloth in front of me. Just walking into La Couronné, let alone sitting there for a few hours, is an aromatherapy treatment in itself. The salon smells incredible. I have become addicted to their Aveda candle Shampure that they often have burning. It is a scent that now fills my home, a little respite treat (along with a nice glass of red wine) after a long hard day. Never ceases to amaze me how these little wonders in life can give so much joy! 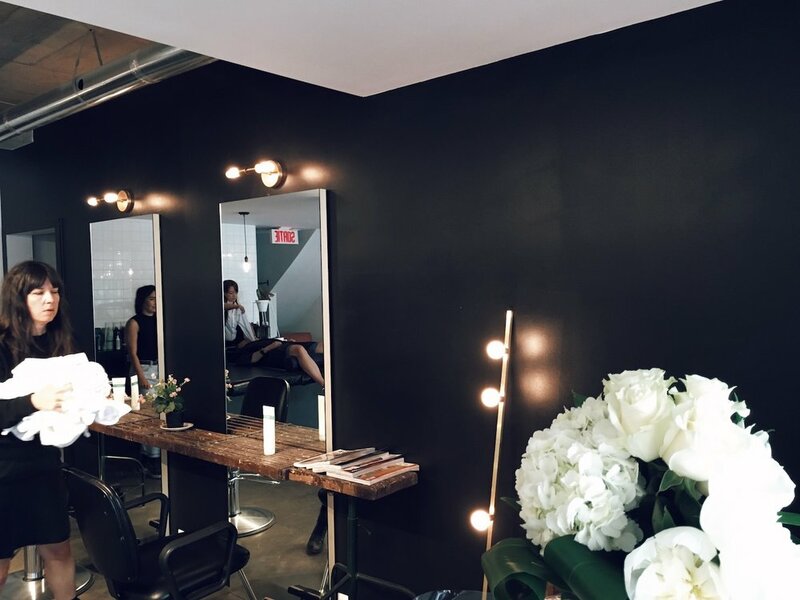 On my last visit to La Couronné, I asked Iseult and my hair colourist Josée LeBrun to talk to me about their inspirations, their Odes to Wonder. Iseult has always served as a bit of a Montreal concierge for me. Our sittings are often filled with chatter about our latest Montreal discoveries from indie bands to restaurants to local getaways and activities to do with our kids. She has turned me on to great restaurants and bars such as AlexandraPlatz Bar, a Berlin-inspired bar tucked away in the industrial area of Mile X, Restaurant Manitoba and Le Butterblume, my latest favourite place for lunch. When I sat down with Josée for my colour, she told me about her background. She spoke at length about her admiration for her mentor, a fellow colleague who taught her the trade. I notice a warmth in her voice and the corners of her mouth turn up slightly as she speaks about the impact this woman had on her as an adolescent. "She taught me more than just how to colour hair. Our times together were precious. We would joke around and laugh, she would guide me through my teenage foolishness, teach me about food, about music. She was older than me but very cool and because of her, I never had the fear or aging. If you take care of yourself and others, you age well." As I reflect on this idea, it dawns on me that like Josée and her colleague, we are talking about more than just hair. I ask her if there is anyone else that inspires her. Without hesitation, she says, "My 12 year old daughter. Setting limits always makes you change because if you are really to listen to the message, you in return have to walk the talk. You are forced to change yourself. You have no choice but to learn and teach the good things, to show a belle image. Life is not obvious, I must show the beauty in things so that she in return can do good things that can make a difference." Pondering on this thought, she pauses then adds, "It's important that young girls find someone older that inspires them, that nourishes them, someone outside of parents or friends, someone that can be a great resource and mentor". The idea of girls and women benefiting from having resources through mentorship rings true with me. I'm experiencing it first hand. And as I leave, it becomes clear to me why I always leave this salon feeling regal.